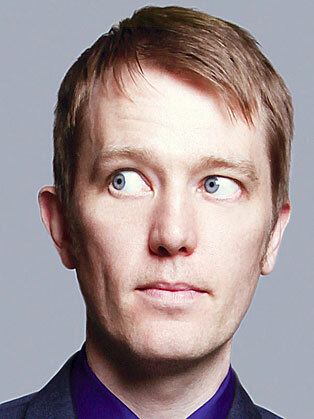 Alun Cochrane is one of the best stand-up comedians in the UK. He tells tales about eating, sleeping, daydreaming, driving, being a son, father, brother, friend, mortgage-holder, clothes-wearer, car-owner, radio-listener, train-traveller, door-opener (and closer), alcohol-consumer, hangover-sufferer, newspaper flicker-through-er, occasional football watcher, and general liver of life, in short; he gets material from anywhere he wanders in mind or body. He can be heard every Saturday morning from 8am on Frank Skinner's Absolute Radio Show. Alun is a Perrier nominated Stand Up comedian who is known from TV and radio including BBC One's Michael McIntyre's Comedy Roadshow, Dave's One Night Stand, Have I Got News For You, BBC Two's Never Mind The Buzzcocks and Mock The Week, Channel 4's 8 Out Of 10 Cats, and headlining Live At The Comedy Store on Comedy Central. Alun has hosted his own BBC Radio 4 comedy show as well as appearing on countless panel shows. In 2014 he went back to the world of acting (his first role was as Jason the Asthmatic) and starred in Living's Trying Again. As an Edinburgh regular, Alun's 2014 show was a critically-acclaimed sell-out which sparked a nationwide tour.